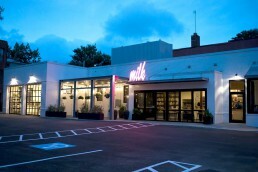 Milk Bar is a chain of dessert and bakery retail outlets owned by chef, founder, and Master Chef judge, Christina Tosi. Christina was originally employed by David Chang, owner of Momofuku restaurant, in 2005 to help administratively. She was quickly hired as the first pastry chef for the restaurant group and soon after she was encouraged to open up her own shop. On November 15, three years later, Milk Bar was born. 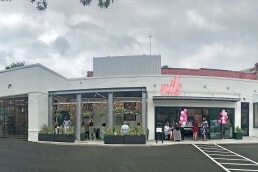 The latest Milk Bar location – Christina’s 14th to date – is the largest and most accommodating outpost in her growing family of confectionary shops. It also serves as the bakery’s flagship location. 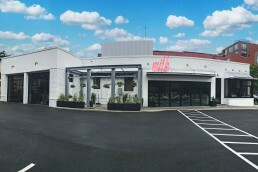 Situated in Logan Circle Washington, D.C., the 2,383 square-foot bakery is housed in a former auto-mechanic shop that was built in 1927. 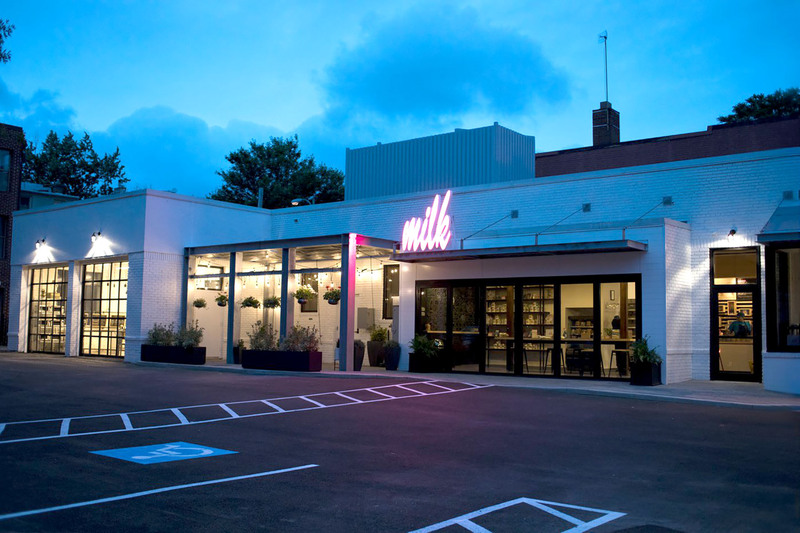 Retaining most of the building’s historic elements, the Milk Bar’s signature colorful pallets, chalk-like designs, and pink neon signage was successfully woven into the existing design. Like the other branches, the menu here showcases Christina’s innovative desserts including cereal milk soft serve, compost cookies and crack pie. What makes this location so different is its roomy café space which includes a “Milk Lab” where wild flavour ideas come to life, a classroom and events space, and cozy indoor seating. 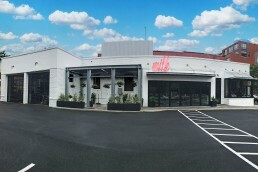 There’s also plenty of parking, a walk-up window and a gorgeous new outdoor patio. 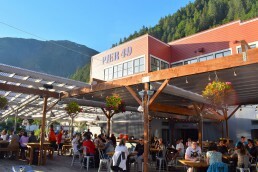 Continuing their relationship with Potomac Construction, a heavy gage I-beam steel structure was fabricated to match the industrial style of the former auto-mechanic shop. 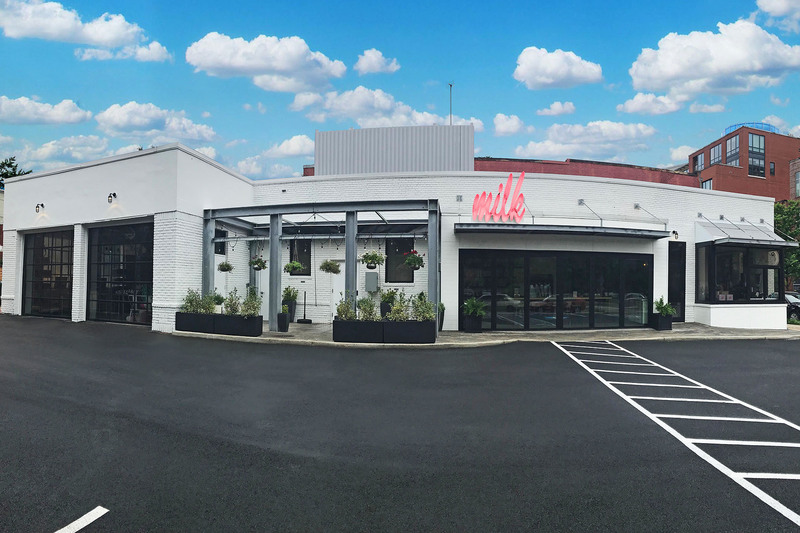 The addition of two 12×12 retractable rope canopies topped with a Harbor Time Onyx fabric was the perfect complement to complete the Milk Bar’s modern touch. 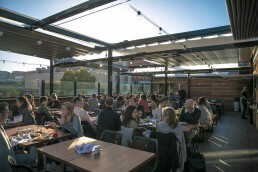 The alfresco-chic dining spot was outfitted with ShadeFX canopies for the sole purpose of encouraging guests to stay and relax while indulging in Milk Bar’s alluring Logan Circle exclusives. 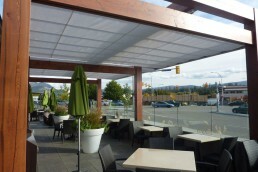 The versatile shade ensures that patrons can comfortably spend more time outside soaking in the sunny rays or being sheltered on those rainy days. At this sugary wonderland, you can have your cake, bake it and eat it too. 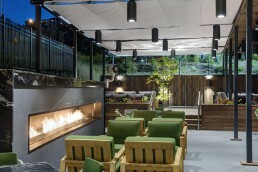 Stop by for a taste of baked decadence in a unique space, both indoors and out. 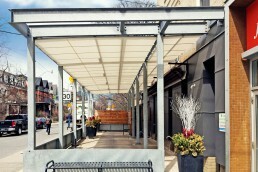 Want to cover your outdoor patio? Find out more about our solutions. 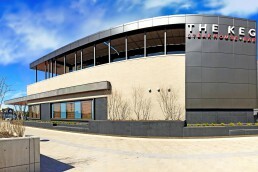 A heavy gage I-beam steel structure was fabricated to match the industrial style of the former auto-mechanic shop. 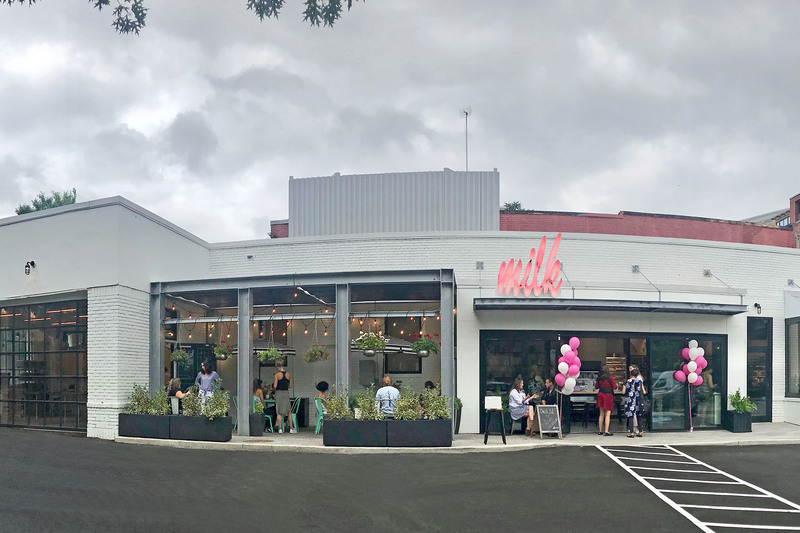 The addition of two 12×12 retractable rope canopies topped with a Harbor Time Onyx fabric was the perfect complement to complete the Milk Bar’s modern touch.